ALONG THE JOURNEY of life we all have milestones, major events that direct us and mold us to become the individuals we are. Sometimes these fateful events are joyous and pleasant; often they are tragic or miserable. One of mine was frightening. In 1987, I, my wife, Chanchar, and our two children (Dharmesh, 15, and Kavita, 5) were living in our home in Groblersdal, South Africa, a quiet village about two hundred kilometers north of Johannesburg. Our new home was a lonely farmhouse about ten kilometers from town. One weekend, Chanchar and the children were away visiting my parents in Durban, and I was home alone. It was a typical quiet evening on the farm, with not much to listen to other than crickets chirping in the fields. Living far away from anyone the nearest neighbor more than a kilometer away we never locked our doors or took precautions of that sort. Relaxing on my recliner, I heard footsteps moving quickly around the outside of the house. Before I had time to react, three men burst through the front door. One pointed a revolver at me. Two men ransacked our belongings while the third held the gun to my face. For more than fifteen minutes, which seemed like eons to me, they packed cash, jewelry, and other valuables into their car. A fourth man had driven up to the house after they’d entered. I remained helpless, looking down the barrel of the gun. Although I was not born or raised in India, my ancestors were. My grandfather had immigrated to South Africa from Gujarat. Our family continued to worship Lord Krishna throughout my childhood. As I sat with death staring down at me, ideas started to flash across my mind. I had read in the newspapers that sometimes robbers shoot people and roll them up in a carpet to die. There have been many such murders in recent times. To eliminate possible witnesses, robbers sometimes murdered old people after robbing their houses. “They’re going to do the same to me,” I considered in horror. I thought of many things I wanted to do. I tried to imagine how my wife and children would feel when they found my dead body. I could vividly visualize His beautiful form, standing next to His eternal consort, Srimati Radharani. His smiling face and beautiful lotuslike eyes relieved me of all my anxiety and fear. I stopped worrying about the robbery, the people threatening my life, and the barrel of the gun pointing at my head. I felt that if I could die now, that would be the perfection of my life. Quick footsteps and the sound of a car starting brought me back to my external senses. The intruders had made a dash for their car and were driving off. Another car had miraculously driven into my yard, and the robbers had run away. My friend Reg had unexpectedly arrived. Although apparently the headlights of his car had been my savior, in the depth of my heart I knew Krishna had saved me. A few months later we moved from that lonely farmhouse to Durban, but racial tension in South Africa continued to haunt my family and nation. In 1989 we decided to move from South Africa. I developed some business contacts in Australia, arranged proper visas, and made airplane reservations. Around that time I received an invitation from the ISKCON temple in Durban to attend a fund-raising banquet for “phase two” of the center’s development. My wife and I attended and heard the address given by ISKCON leader Bhakti Caru Swami. For the first time in my life I realized that all problems are due to man’s forgetfulness of God, and if we want to solve these problems we must remind everyone who God is. “Why am I running away from South Africa like a coward?” I thought. I resolved to stay there and help the Krishna consciousness movement spread. That evening I donated 100,000 rands (US$40,000), and from then on I became more involved in ISKCON. As time went by, Chanchar and I developed faith by associating with devotees. My life has changed. I have a mission, a worthwhile goal to my existence. My wife and I chant sixteen rounds daily. 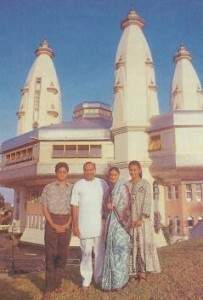 Chanchar performs services several times a week at the Durban temple. In 1990 I was fortunate enough to realize a sizeable profit from my business. While driving Bhakti Caru Swami to the Rathayatra festival in July, I promised to donate another one million rands to ISKCON. I realize, perhaps more than others because of my experience, that all material assets are temporary. Believe me, that fearful night when I faced death is etched in my memory. It sometimes haunts me. I know that at any moment all I have worked for can be ripped from my hands. My possessions are not really my own they have been bestowed upon me by God. It is my duty to use them in His service. All glories to the sankirtana movement of Sri Caitanya Mahaprabhu! Jamnadas Vanmali is now an initiated disciple of Bhakti Caru Swami, who has named him Srinathaji Dasa.